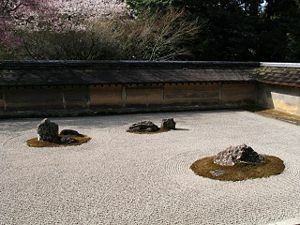 The dry garden at Ryōan-ji, a Rinzai Zen temple in Kyoto. The Rinzai school (臨済宗; Japanese: Rinzai-shū, Chinese: Linji-zong) is one of the two major Japanese Zen sects. The other major sect is Sōtō). The Rinzai School made a decisive contribution to the formation of Japanese culture by becoming its spiritual cradle. The spirit of Zen developed, adopted, or transformed existing practical techniques, skills, and cultural practices such as martial arts, flower arrangement, tea ceremony, painting, dancing, and music into a means of spiritual formation, character cultivation, and embodiment of virtues. The concept of using practical techniques and sports as a means of cultivating moral character and spirituality is a central characteristic of Japanese culture, and this concept is still in use today. The term “do” used in “Bu-do” (marshal arts), “Ka-do” (flower arrangement), and “Sa-do” (“tea ceremony”) is evidence of this Zen characteristic. Rinzai Zen developed under the patronage of the lords and Samurai class. The Rinzai school is known for its emphasis on sudden enlightenment and the use of methods such as the koan (meditation on paradoxical questions) to achieve this end. Rinzai is the Japanese branch of the Chinese Linji school, which was founded during the Tang Dynasty by Linji Yixuan. It was brought to Japan by Myoan Eisai in 1191. Unlike the larger Sōtō school of Zen, Rinzai is not a single organized body. Rather, it is divided into fifteen sects, referred to by the names of their head temples. The largest and most influential of these is the Myoshin-ji branch, whose head temple was founded in 1342 by Kanzan-Egen Zenji (1277 - 1360). Other major branches include Nanzen-ji, Tenryu-ji, Daitoku-ji, and Tofuku-ji. Rinzai encourages an active pursuit of enlightenment, through the intellectual stimulus of the Koans, or the strenuous efforts and strict discipline of martial arts. It can be contrasted to Sōtō Zen, which insists on "just-sitting" (Zazen) as the method of choice to reveal the innate Buddha nature in everyone. 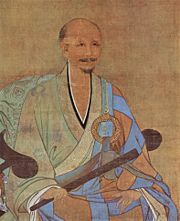 Myōan Eisai, founder of the Rinzai School of Zen in twelfth-century Japan. Rinzai was adopted by the samurai caste, whereas Sōtō had a more popular following, as described in the Japanese saying "Rinzai for the Shōgun, Sōtō for the peasants." (JPN: "臨済将軍、曹洞土民" Rinzai Shōgun, Sōtō Domin). 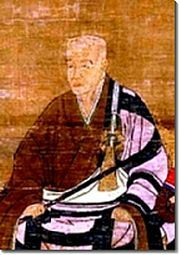 In pre-modern Japan, Rinzai was widely popular among the warrior aristocracy and samurai, while Sōtō Zen was associated with artists and poets. This is due to Rinzai Zen’s reputation for removing all fear of death via direct experiential transformation of consciousness. For a Samurai, fear of death was naturally a great obstacle to success, so the practice of Rinzai Zen was a practical necessity. Rinzai also emphasizes koan literature and intellectual knowledge more than Sōtō, giving it a greater appeal to the educated and literate upper classes. However, one of the most intellectual and literate of pre-modern Zen masters was the Soto Zen master Eihei Dogen. Because the medieval aristocracy was also a warrior class, it became natural for them to apply Rinzai teachings to matters of combat. Some have argued that Samurai influence co-opted the essential Buddhist origins of Rinzai Zen. After meeting with opposition from the traditional schools of Buddhism in Kyoto, Eisai personally introduced Rinzai Zen to the samurai warrior caste of the Shogun court in Kamakura around 1199. Koan practice (concentrating on koans during meditation and other activities) is particularly important among practitioners of the Rinzai sect of Zen. Wuzhun Shifan (1177-1249) was the Chinese teacher of Enni Ben'en, the founder of Tofukuji. Koans are said to reflect the enlightened or awakened state of the historical sages and legendary figures that uttered them, and are sometimes said to confound the habit of discursive thought or to shock the mind into awareness. The Rinzai school is also particularly associated with the Japanese tea ceremony. Eisai is said to have introduced tea from China to Japan, together with the method of mixing powdered green tea in hot water. Ikkyu in the fifteenth century developed the tea ceremony in ways that made it prominent in Japanese culture. Tea, a light stimulant, originally had a spiritual purpose in maintaining meditational wakefulness in Zen monks. One legend attributes the origin of tea in China to Bodhidharma, a sixth century Indian Buddhist missionary, and the first Zen patriarch, who, according to legend, cut off his eyelids to keep awake during meditation. Tea plants supposedly grew where his eyelids fell. During eighteenth century, the Rinzai School had undergone a period of decline and stagnation. At this time, Zen Master Hakuin Ekaku became prominent, and his vigorous methods spearheaded a long-lasting revival of Rinzai. Today, Hakuin is perhaps the most revered Rinzai ancestor. The Japanese Obaku Zen sect is also descended from the Chinese Linji school. However, Obaku was brought to Japan several centuries later, in the seventeenth century, and shows significant influence from the Pure Land school, which is largely absent in Rinzai. Miura, Isshu. 1967. Zen Dust: The History of the koan and koan study in Rinzai (Lin-chi) Zen, New York: Harcourt Brace. Rui Zhu. 2005. “Distinguishing Soto and Rinzai Zen: manas and the mental mechanics of meditation” in Philosophy East and West 55(3): 426. University of Hawaii Press. July 1, 2005. Available online. Sasaki, Ruth Fuller. 1960. Rinzai Zen study for foreigners in Japan. First Zen Institute of America in Japan. This page was last modified on 13 July 2015, at 21:57.